Salvaging, reusing and repurposing old fittings and furnishings to adorn new restaurants is nothing new; it’s been an ongoing trend in the English-speaking world for at least a decade, if not more. Renovating old buildings, while judiciously paying homage to their original purpose, has received less attention but will likely become even more prevalent as ever more restaurants scramble for ever fewer affordable properties in London’s feverish property market. 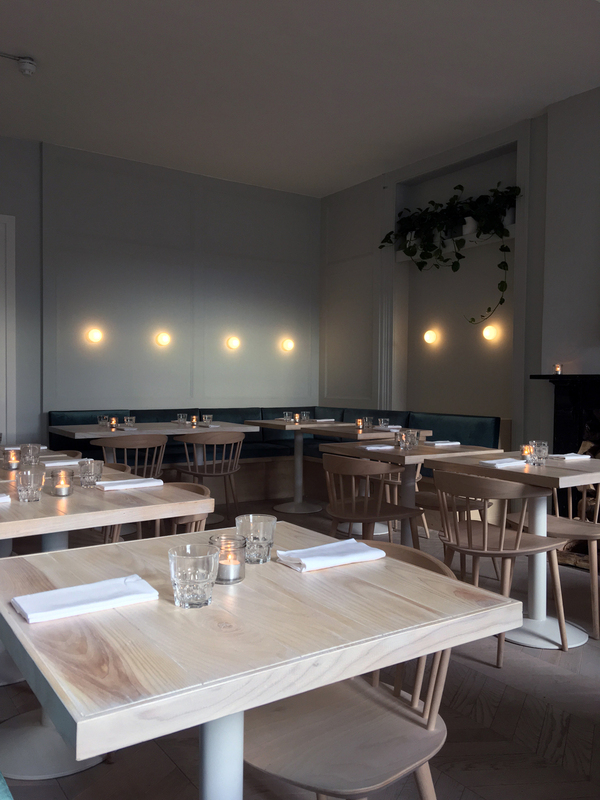 That brings us to Coal Rooms, a brand spanking new meat restaurant set within what was once the Peckham Rye train station ticket office. The contrast between the restaurant and the grimly utilitarian modern station immediately next door, as well as the other neighbouring retail units, couldn’t be more profound. A café area leads to a sleek open kitchen with counter seating, while the main dining room is airy and soothingly decorated. ‘Peckham Coal Rooms’ sounds so much better than ‘Coal Rooms Peckham’ or just plain old ‘Coal Rooms’. The one unaltered area that I could see were the listed Victorian-era toilets, resplendent with tiles and brass fittings. Although certainly pleasing to the eye, I suspect the murky lighting and draughtiness will prove to be liabilities once winter starts to bite. Service was clearly a work in progress across all of my visits. At best, the staff could be friendly and reasonably efficient. At worst, I was left waiting before 35 minutes before my dinner order was taken and had to repeat my coffee order multiple times before it finally registered. Sometimes all that hassle can be worth it. The pork and smoked eel sausage was more of a loosely packed patty (and somewhat similar to those served at Pitt Cue), but no less delicious for it. The fatty pork melded with the unctuous eel, the smokiness of both bolstering the other. It’s not the king of sausages, but it would certainly qualify as a prince or possibly an archduke of wienerkind. Battered cod kedgeree was an odd dish combining firm quinoa-ish rice and oil-free, but ultimately unmemorable cod goujons. 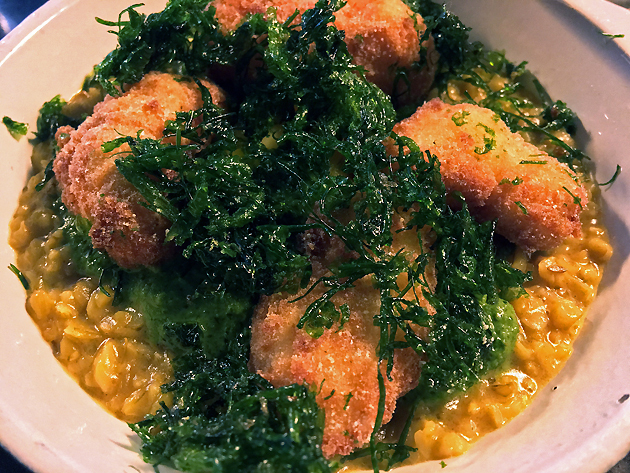 Despite its resemblance to fried and sliced cabbage, the seaweed was probably the real deal with its umami adding some much needed depth to the rice. It’s a peculiar kedgeree when the fish takes a back seat to the rice. 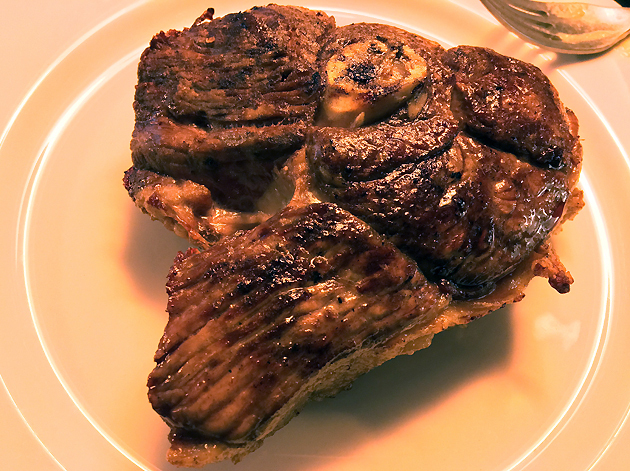 The continent-sized goat chop was certainly big, but the crust wasn’t anywhere as crisp and caramelised as it should’ve been. 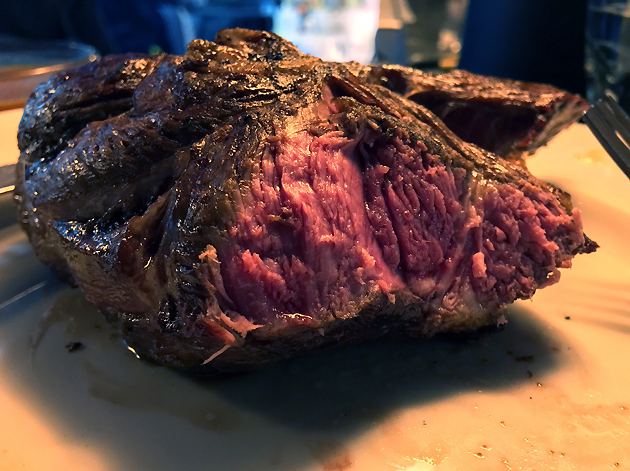 The meat underneath, cooked rare, was barely distinguishable from beef but it was at least moist. Compared to the far superior goat chop sometimes available at Temper City and it’s no comparison at all. 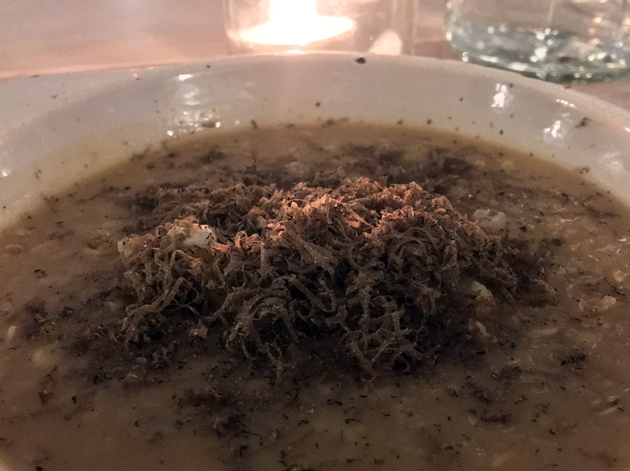 This dish felt like a well-intentioned but ultimately ill-advised homage to the popularity of goat at Peckham’s traditional butcher shops. This review’s procrastination was brought to you, in part, by London Grammar. Grits were too smooth and gruel-like for my liking, bearing less of a resemblance to its American namesake and looking more like a morning bowl of porridge. 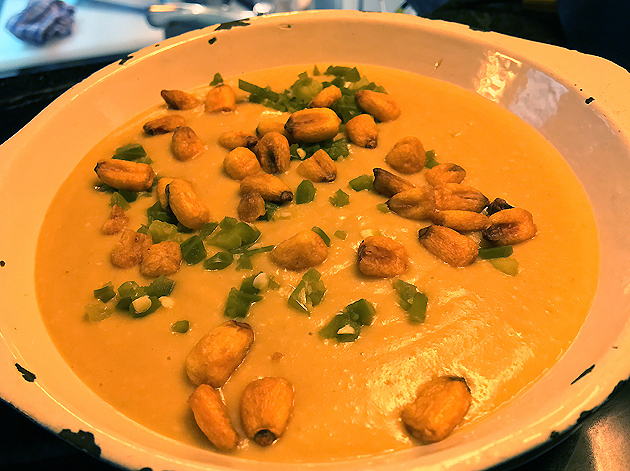 It tasted just as beige as it looks, leaning entirely on nutty, caramelised corn kernels and slice of hot chilli pepper for flavour. Someone in the Coal Rooms kitchen clearly has a talent for sausagey dishes. 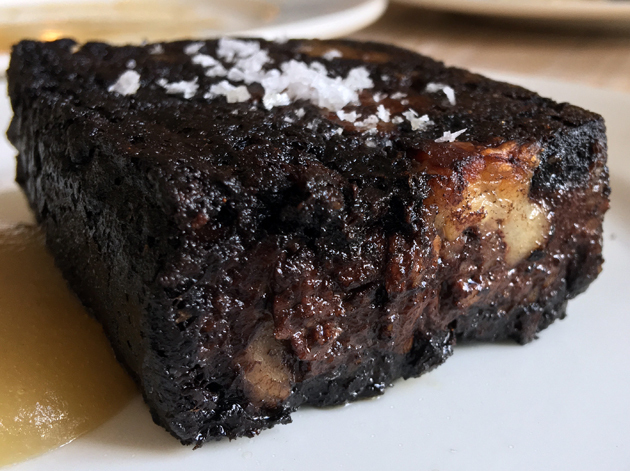 The black pudding was airy yet rich with plenty of umami and meaty tanginess. A sharp apple sauce, served on the side, helped cut through all the richness. Despite being only modestly battered and deep-fried just-so, the mackerel’s qualities were so well hidden that it really could’ve been any fish. It became something of a chore to eat, a task livened up the crispy and oil-free batter, the creamy mayo and the crisply sharp spring onions. Fish doesn’t appear to be the kitchen’s forte. 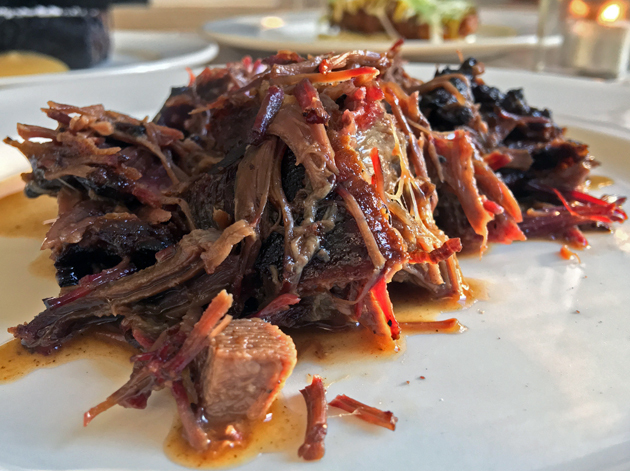 Once I dug past the reasonably woody bark with its mild sweetness, the tender strands of ox cheek and jowl proved to be something of a disappointment. The beefy bits were not only lacking in character, but were arguably a little too soft without much bite. 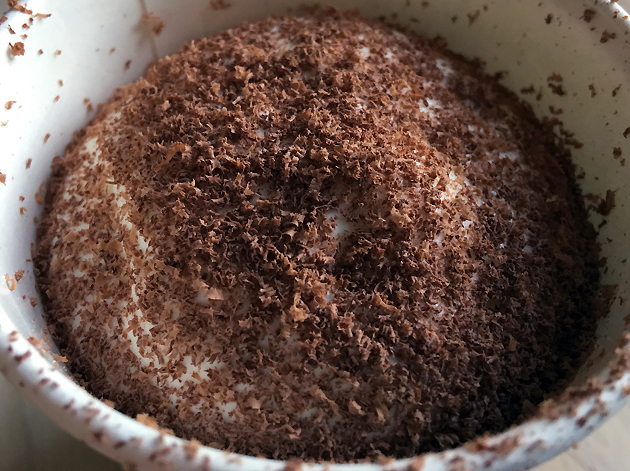 The tiramisu almost looked like an ice cream at first glance in its paper cu[, but it was definitely our familiar layered dessert chum once you dug your spoon down. A milky foam, a bracingly cold ice cream, a surprisingly chewy chocolate sauce, gritty oat crumbs and a mildly artificial coffee flavoured base followed one after the other. Some elements were enjoyable, others were not. It just didn’t come together as a cohesive whole. Served in a paper cup, so possibly brought in from elsewhere. 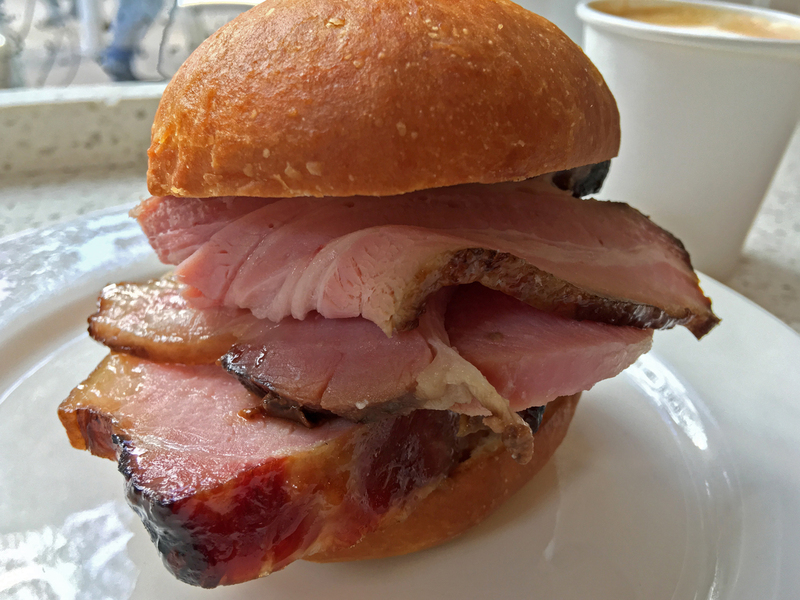 Coal Room’s bacon sandwich has received a lot of attention and it’s not hard to see why. The dense, tightly crumbed yet light-tasting bun was the vessel for doorstop-thick gammon-like slices of bacon rimmed with succulent strips of fat. The curls of bacon were elevated to new heights by a fruity flavour that’s apparently a result of the kitchen curing the pork in coffee. It’s not only a better bacon sandwich than Dishoom’s overhyped bacon naan, but also quite possibly one of the most satisfying and luxuriant bacon sandwiches in this city. And it’s filling enough to fuel entire armies to boot. 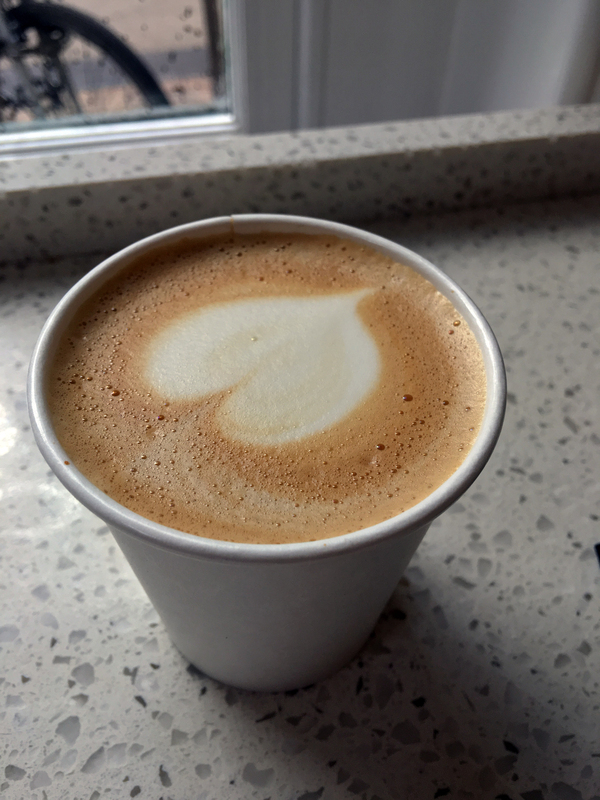 The flat white had a non-existent head, was a bit too watery and wasn’t anywhere silky enough. It did have a pleasing bittersweet maltiness though as well as a caffeine kick that was enough to keep me going well into the afternoon. I’m a big fan of bitter, sour and tangy flavours that others find displeasing. 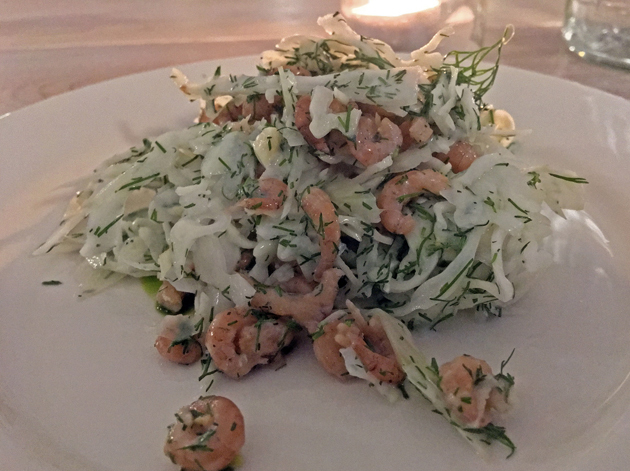 But even I struggled with the shrimp, fennel and buttermilk salad which quickly become something to be endured rather than enjoyed. The vegetal tanginess and bitterness was off-putting and grimace-inducing rather than pleasurable. Congee-like oatmeal was deeply unappealing with its sticky, gooey, excessively gruel-like texture that was sickly in the extreme. The best thing here, by far, was the taut and slightly bitter leeks. Everything else was inedibly disgusting. 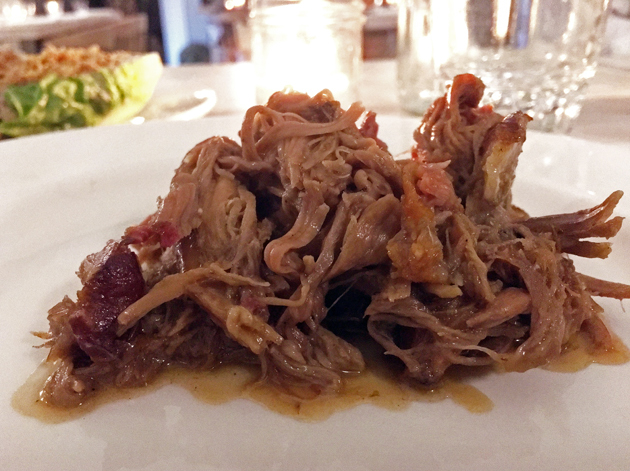 Smoked lamb shoulder was unsurprisingly similar to pulled pork, given the use of both smoking and a shoulder cut of meat. The unctuous, moist, tender and earthy strands had a smoky undertone that didn’t overwhelm the other qualities. A tender burden to shoulder. I was thoroughly unconvinced by the ‘umami’ salad. Crispy gem hearts came dusted with what I thought might possibly have been dried shrimp or pork floss, but turned out to be yeast residue of all things. 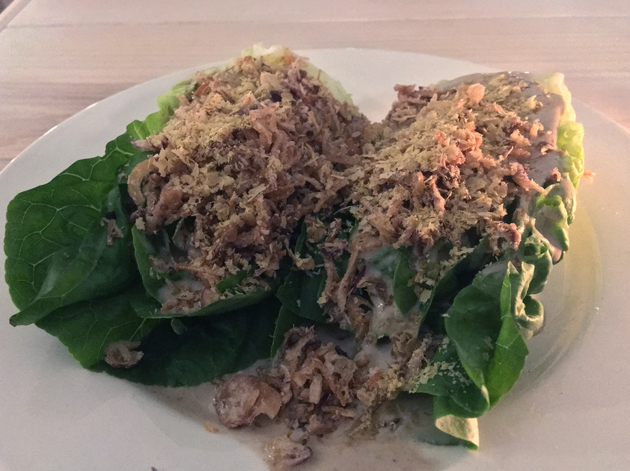 Whatever it was, it packed zero umami which is a problem for an ‘umami’ salad. Not only was it not umami in the slightest, I don’t get how this qualifies as a salad. 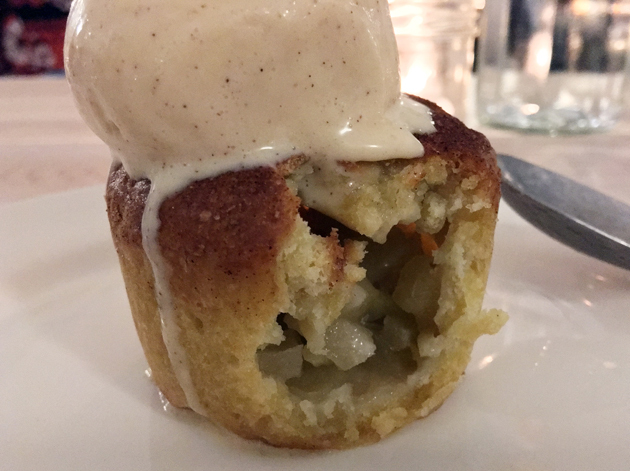 An apple and cheddar pie sounds quixotically cutting edge, but the reality was far less exciting. A large pie made with cheese scone-like pastry came filled with unexpectedly chilled cubes of apple. Whether this dessert was meant as an in-joke or just bad satire, I just didn’t get it. I was far enamoured with the distinct heat of cinnamon in the smooth ice cream. Now I’m wondering what an ‘actual’ cheddar pie would taste like. 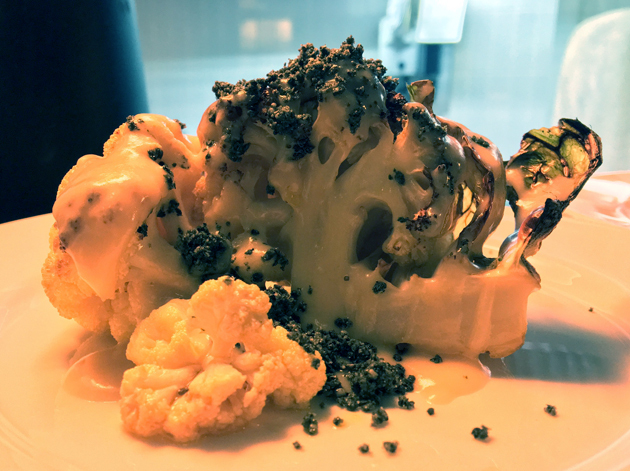 A firm head of cauliflower topped with seaweed had a pleasing level of umami. The portion size was arguably too large for a starter, with the lack of nuance quickly becoming apparent. Still, it’s one of Coal Rooms’ better vegetable dishes. Fleshy aubergine came topped with a melted cheese, a sort of salty mozzarella, and an umami tomato sauce. 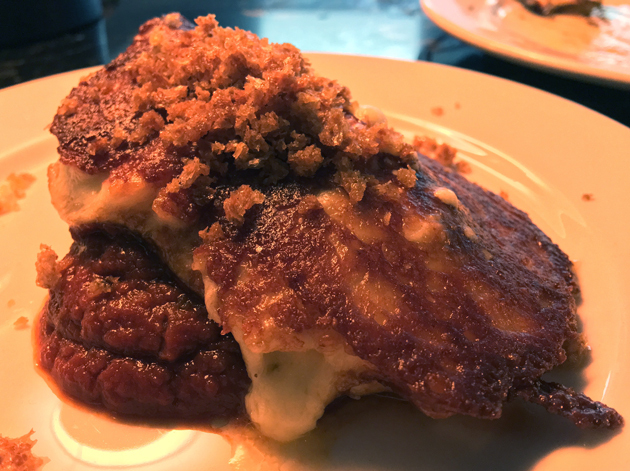 The layering came across as a somewhat odd but nonetheless flavoursome cross between imam byaldi and Aubergine Parmigiana. 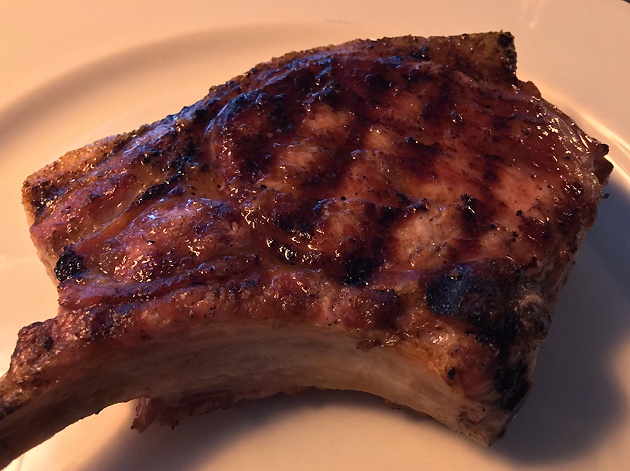 The pork chop was technically excellent – neatly browned on top, reasonably tender underneath with the whole thing rimmed by a rich and quivering ring of fat. 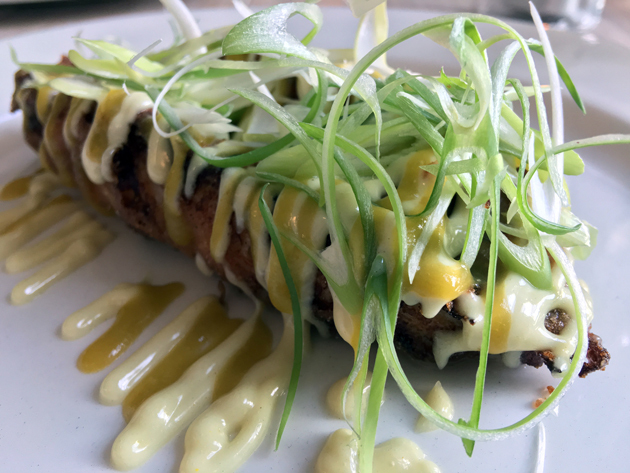 It’s therefore a real shame that the swine flesh itself was so unmemorable – a blank white slate of nothingness that wasn’t a patch on the characterful pork available at Pitt Cue. 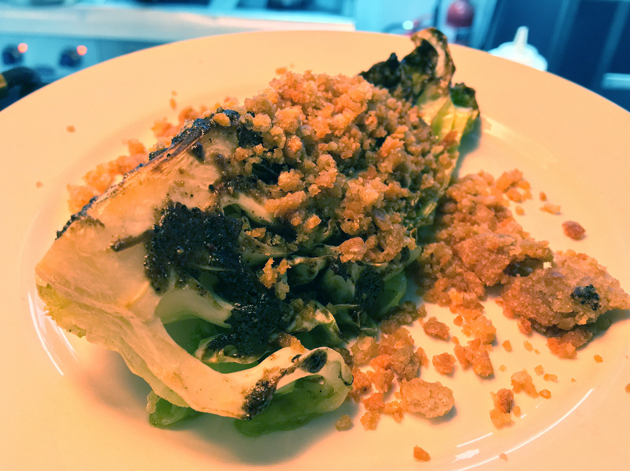 Reasonably supple leaves of hispi cabbage were dressed in ‘jerk spices’, although the sticky glaze tasted more like a reduced soy sauce with a hint of Thai peppercorn to me. Regardless, it packed a substantial umami and a punchy smoky heat too. It was arguably a little too overpowering, especially when taken with the bits of pork crackling that were so hard they could’ve been used to break rocks. Even so, it was a pleasing side dish overall. 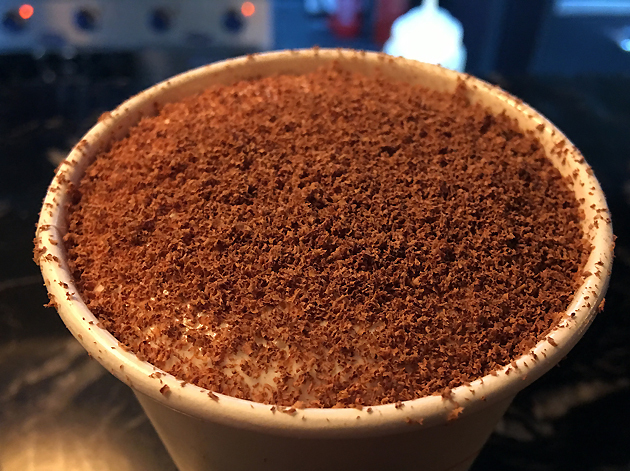 The tiramisu was much the same as it was before. The quality of both Coal Rooms’ cooking and service can be highly variable with some gems mixed in with the sand and rocks. The bigger overarching problem is that the Coal Rooms wants to be both a neighbourhood restaurant and a destination restaurant, but isn’t currently good enough to be either. Hype from other reviewers has made it very difficult for walk-ins to snag a seat – at either the counter or a table – and yet the cooking as a whole isn’t anywhere good enough to justify such devotion. The bacon sandwich is one of the few stand-out dishes, but it’s currently only available from 9am onwards when most people are either at work or well into their commute. Coupled with the 5-10 minute wait for it, I wonder who exactly has the time to order and enjoy one apart from dilettantes, reviewers and dilettante reviewers. The Coal Rooms. Enjoy, but with a pinch of salt. Opening Hours: Monday-Saturday noon – 15.00 and 18.00-23.00. Sunday 09.00-18.00. Breakfast – Monday-Saturday 09.00 – midday. 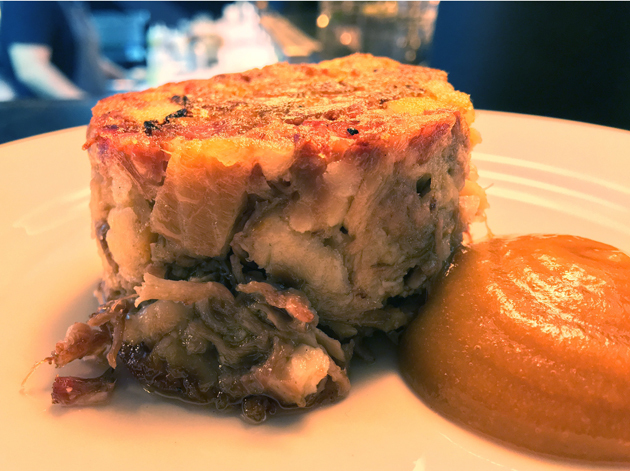 Tags: apple, aubergine, bacon, black pudding, cabbage, cauliflower, chop, coal rooms, cod, coffee, deep fried, eel, fennel, flat white, goat, grits, ice cream, jowl, lamb, leeks, london, mackerel, ox cheek, peckham, pie, pork, restaurant, review, salad, sandwich, sausage, seaweed, shrimp, tiramisu. Bookmark the permalink.